WoodSpring Suites Augusta Riverwatch features a kitchenette with a stovetop in every room. A 24 hour reception is on site. 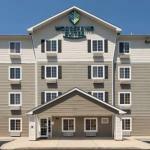 A TV with satellite and movie channels and a desk are provided in each room at WoodSpring Suites Augusta Riverwatch. Each room has an en suite bathroom with a bath and shower combination towels and linen. Free parking is provided on site for added convenience. A launderette and a vending machine are available to all guests for a fee. The hotel is 5 km from Augusta National Golf Course while the Augusta State University is 5.5 km away. Augusta Regional Airport is within a 20-minute drive.